THIS!! Guys, this is seriously what the bike should’ve come with from the factory. 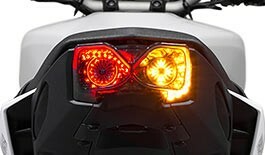 I guess I can understand Yamaha saving the money to keep the price down but I can’t recommend the integrated tail light enough. Advantages: Very bright, great look, use it by itself for the clean look or add flush mounts or pods if you want to really be seen. Super easy to instal. Disadvantages: Bike should’ve come with it. Install was a breeze.. I got the smoke colored lens... looks are awesome... it’s super bright... and the functionality of this light just works! Diggin the different modes!! TST did BADASS on this one!! Thanks! I purchased the smoke finish version of this tail light and I have to say I'm overall very pleased with the design and look of the system. It was relatively easy to install and allowed me to delete the original pumpkin blinkers on the rear end. If I had to complain about one thing, it'd be this - there is now about a second long delay between hitting the blinker switch and activation of the blinkers. That's really just a slight inconvenience though. The only other thing I'd say to be aware of, especially if you live in a heavily regulated state such as Commiefornia; these are not DOT approved. Crazy look on my Fz09, looks like a beast now!! No more ugly bulky turn signal!! Excellent looking light and super easy installation. I like the strobe feature of the brake light although the 100% strobe seems a bit excessive. I'm running the strobe to solid brake setting with the sequential blinkers, the strobe blinkers look pretty cool too. Advantages: I installed the light, relay, and closeout panels in about 30 minutes. It took a 10mm socket, 10mm wrench, 8mm socket, 3mm allen key, 4mm allen key, and a phillips head screwdriver. It really blows the stock setup out of the water. You can tell this tail light was thoughtfully designed for this bike. It looks awesome, the leds are super bright, and the installation video makes this install extremely easy. Thank you guys for awesome products and ALWAYS including detailed installation instructions. Advantages: Looks great, easy install, bright, no more turn signals. Disadvantages: Literally none. Although you will need a closeout panel if you don't have one already (look a bit off without one). Holy crap this tail light looks amazing on the FZ. The smoke is great for the black back and it fits flawless on the bike. Highly recommend for anyone wanting to clean up the back of the bike.